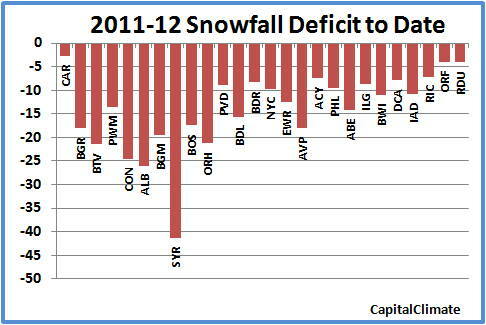 The Northeast and Mid Atlantic are not the only regions with significant snow deficits at the end of the third quarter of winter 2011-12. 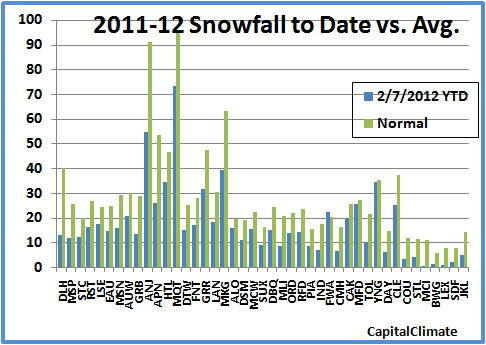 National Weather Service reports indicate that the Midwest is averaging 40% below the normal snowfall season-to-date. 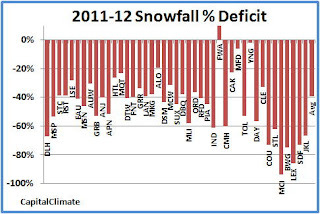 Of the 43 major reporting locations in Minnesota, Wisconsin, Michigan, Iowa, Illinois, Indiana, Ohio, Missouri, and Kentucky, only Ft. Wayne, Indiana has had more snow than the climatological average, by a mere 2.2", or about 11%. 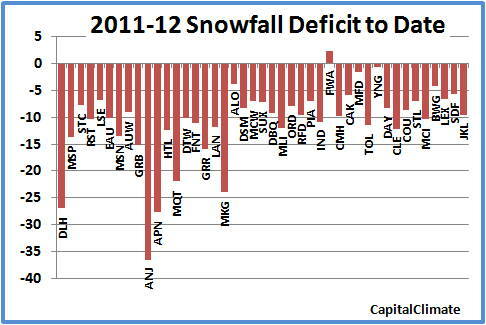 The largest deficit in absolute terms is at Sault Ste. Marie MI, where the current total of 55" is over 3 feet less than the normal amount to date of just over 91". 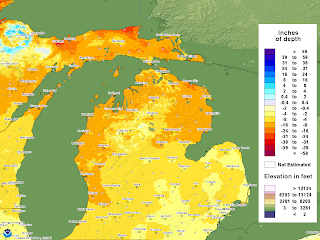 The map of snow depth on the ground for central and northern Michigan as of February 4 shows deficits of 2 feet or more in the Upper Peninsula. 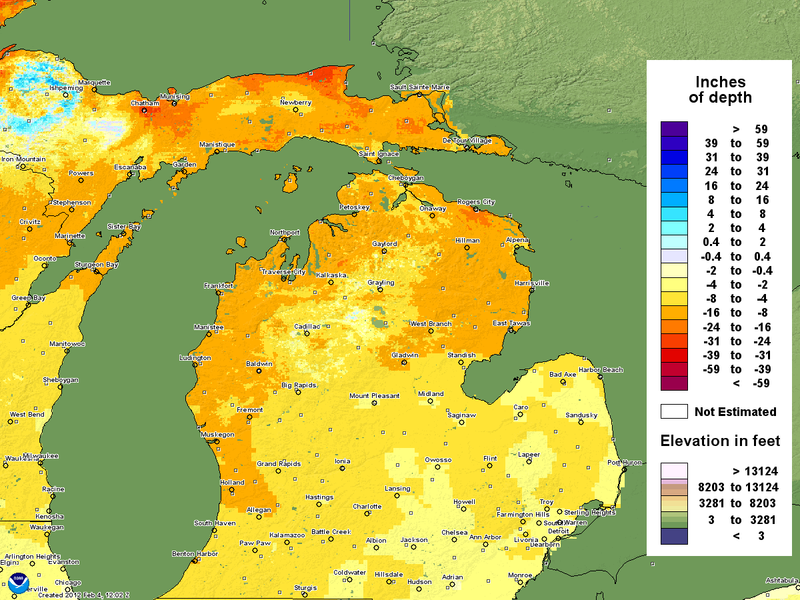 Temperatures at Sault Ste. Marie have been well above normal for all 3 winter months (December +3.8°, January +6.0°, February to date +13.1°). 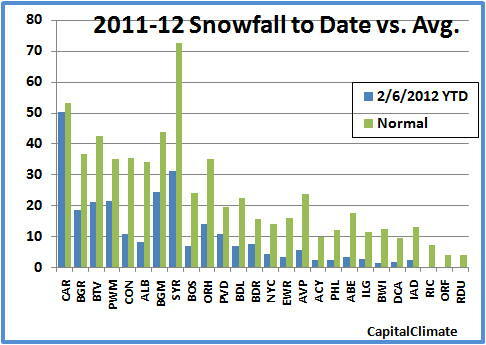 Percentage-wise, the less than 1" at Kansas City MO is 94% below average. 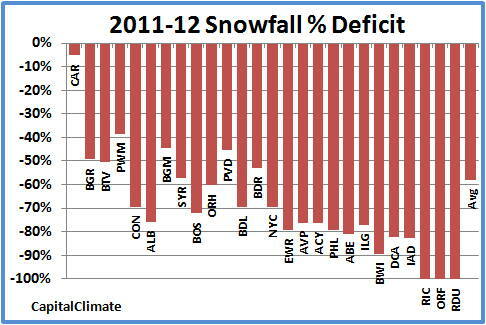 The weighted average deficit across all reporting stations is 39%. 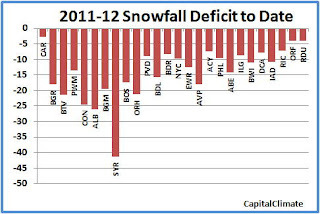 With 3 weeks left in February, the winter of 2011-12 enters its fourth quarter with a major snow deficit in much of the U.S. 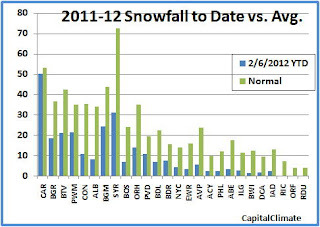 In sharp contrast with last season, Northeast and Mid Atlantic winter snowfall to date is averaging nearly 60% below the climatological mean. 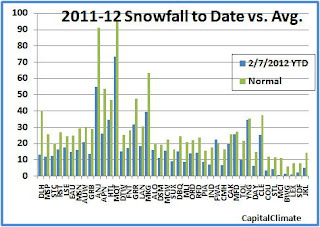 National Weather Service reports through February 6 show that stations from northern Maine to central North Carolina have all seen snowfall amounts below normal. 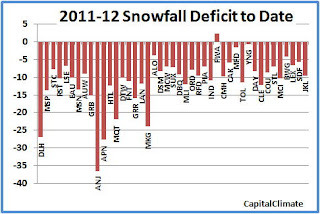 In absolute terms, the deficit amounts range from 2.8" at Caribou, Maine to over 41" at Syracuse, New York. 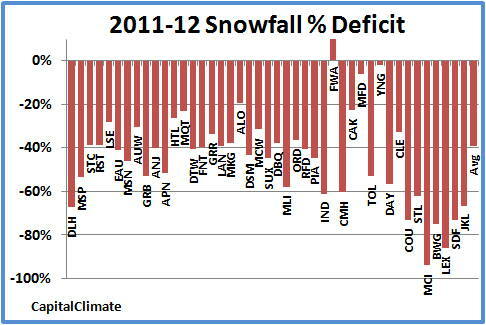 Percentage-wise, Caribou is only 5.3% below normal, while the southern locations in Virginia and North Carolina are at 100%, with no measurable snow reported. 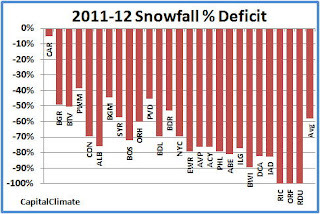 The 3 major reporting locations in the Washington, DC region are all over 80% below normal, with Baltimore's BWI at nearly 90%. The National Weather Service reports that the 4.34" of rainfall at Key West, Florida on February 5 is a new all-time daily rainfall record for the month of February. It also put this month into the position of 9th wettest February in climate records extending back to 1871. The 0.22" of precipitation as of 4 pm today moves the month up to 8th place, barely behind the 4.63" just 2 years ago. The wettest February at Key West was in 1872, when 7.19" was recorded. Three of the wettest Februaries at Key West have now occurred in the last 15 years (1998, 2010, and 2012). Key West also set a daily precipitation record by a wide margin on October 17, when the 6.91" smashed the previous record of 4.08" in 1910. INCHES WAS SET ON FEBRUARY 28TH...1954.